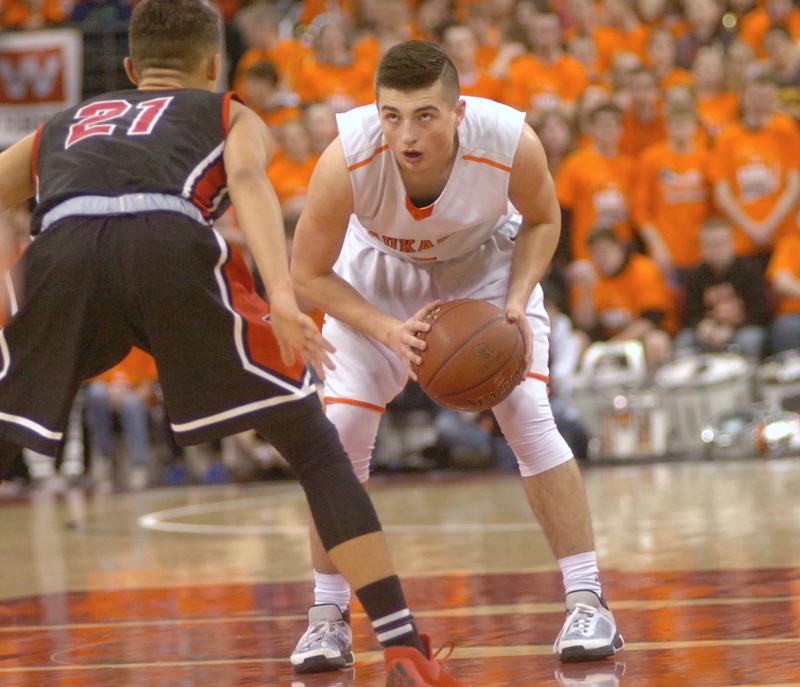 KAUKAUNA — Jordan McCabe, who led the Galloping Ghosts to the WIAA Division 2 state basketball championship in March, announced today he will attend West Virginia University after he finishes his high school career. McCabe made his announcement Aug. 16, 2016, at Kaukauna High School. McCabe will be a junior this fall, and had narrowed his choices to the University of Wisconsin-Green Bay, the University of Wisconsin-Milwaukee, DePaul University, the University of Minnesota and Missouri and West Virginia. Players often make a verbal commitment years ahead of actually entering college as a way of wrapping up what can often be a grueling recruiting process. But McCabe said he didn’t see his decision as a rushed one. With two years of high school left, McCabe, a 5-10, 155-pound point guard, does leave open the option of changing his mind. According to the NCAA, is not uncommon for a student to verbally commit to one institution and subsequently sign a national letter of intent with another intuition. There had been some speculation among reporters during the state basketball tournament that McCabe may forgo his final year at Kaukauna High School to attend a prep school to further work on his game. In any case, McCabe has signaled to other schools that he has made his decision and now can focus on the rest of his high school career. Dan Plutchak, born and raised in Kaukauna, is cofounder of Kaukauna Community News.